Lavinia Lamar-Smith and her husband John believe in the comforting power of a home-cooked meal, but for the last seven Christmases, their holiday meal has consisted of Cheerios or Chinese takeout. After preparing and distributing dinners to hundreds of Detroiters every year, the Smiths have found themselves — and their kitchen cupboards — exhausted. They wouldn’t have it any other way. Since the first “Smith Family Christmas” in 2011, the couple has provided meals to more than 1,500 homeless Detroiters. 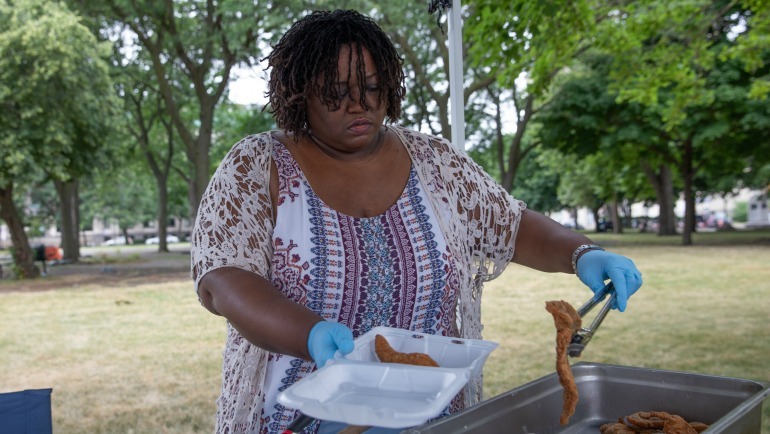 The tradition began when Lamar-Smith — who is associate director of the Wayne State University Cashier’s Office — decided she wanted to help feed the homeless but found herself on a waitlist to volunteer with local organizations like Gleaners, Meals on Wheels and Capuchin Soup Kitchen. Armed with carry-out boxes and a home-cooked spread consisting of ribs, chicken, greens, corn, string beans, dinner rolls, and dessert, the couple loaded up their truck and drove downtown. In their first year, they distributed 50 meals along Woodward, Second and Third avenues and by the Rosa Parks Transit Center. outside the Masonic Temple on July 21. And so they did more — with the growing support of their friends and family, the Smiths have gradually increased the number of meals they prepare each year and expect to distribute 600 meals this December. In recent years, they have outgrown their home kitchen and are now using the kitchen at The Matrix Center on 6 Mile and Gratiot to package their meals and as their volunteer headquarters. In addition to home-cooked meals, the couple also distributes donated hats, gloves, scarves, coats and personal hygiene products. Smith, a former caterer who now works at a security firm, is passionate about cooking. Recognizing that there’s hunger year-round, the Smiths have recently expanded their efforts even further. 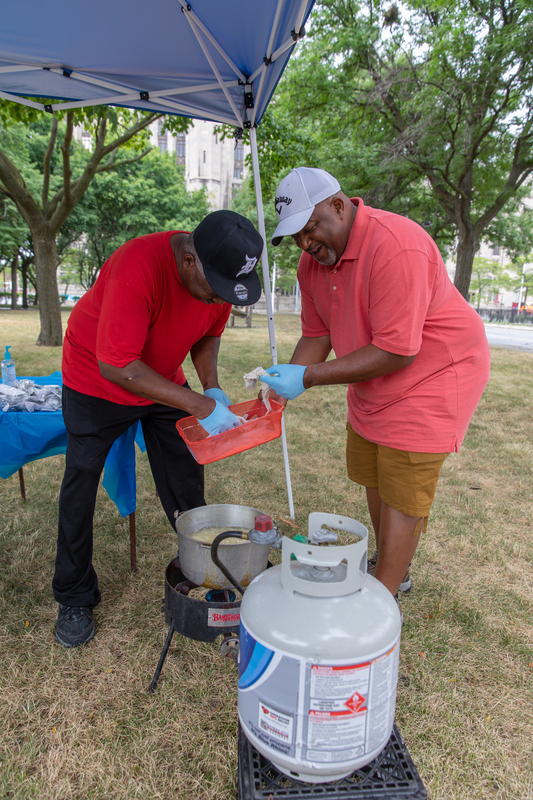 Along with family and friends, they hosted their first summer meal on July 21 — a community fish fry just outside the Masonic Temple. More than 100 attended the event, which included a bike raffle.